The 2017 Australian International Beer Awards proved to be a great night for the Bad Shepherd team with the Cheltenham brewpub's name flashing up on the big screen showing finalists in each category more than once. 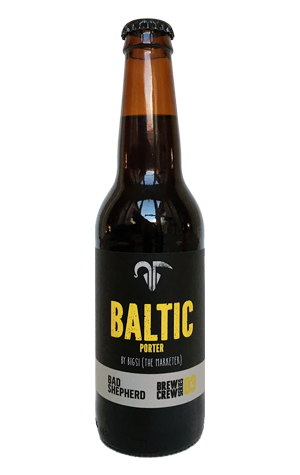 One such appearance was for its Baltic Porter, which in draught form took out the only gold in the Baltic Porter character. It's now out in bottles too as the third in the Brew Crew Series in which non-brewing members get to help design a beer. This time around it was the turn of Bigsi, who we're told is a fiend for liquorice. To translate that passion into beer form, the brewery concocted a pretty traditional Baltic Porter – a bunch of specialty malts to create its dark brown hue and bitter chocolate, espresso and sweeter malt flavours combined with unobtrusive, drying hops. And then they liquorice'd it up via the use of star anise, liquorice root and Black Sambuca. And those additions assume the starring role, to the extent the beer's aroma may rekindle giddy, late night escapades featuring shot glasses and lighters for some. Note: do not set fire to this beer.